Okay, this isn’t really my kitchen or my recipe. K and I have a friend that’s Chinese Burmese (Chinese that were born and raised in Burma a.k.a Myanmar, whatever you want to call it) and his mother often makes traditional Burmese dishes. This time she made ohn-no-kauk-swe (pronounced cow swey), or Coconut Chicken Noodle Soup. Our friend was kind enough to invite us over to have some. The soup is often considered a breakfast dish. It’s thick, rich and creamy – definitely way too heavy to eat on a regular basis. This soup is filled with stewed chicken, wheat noodles, a thick coconut broth, and a load of garnishes including a hard-boiled egg, fried chickpea cracker, cilantro, and lemon. I asked our friend’s mother how long it took her to prepare the meal and she kindly told us it took her an entire day to make the dish. Check out an easy version of the recipe after the jump. Drain out soup to a container, remaining boiled chicken. Throw away chicken bones. Add coconut milk and pea powder. Boil egg and remove shell. Slice. Thinly slice 1/2 lb of onion, wash in water. Drain water. Serve noodle and soup in seperate bowls. I absolutely adore this recipe. It’s similar to something I had when I was young. I love coconut flavoured curry with noodle. It’s my ultimate comfort food. You’re totally right. It is a comfort food. 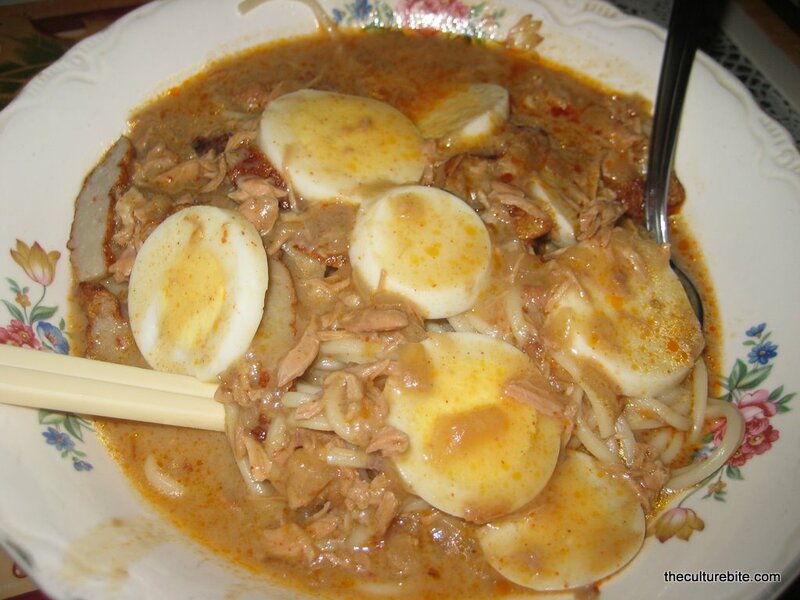 One of my childhood friends is Burmese and her mother fed this soup to me as I was growing up. I still can’t get enough of it! It is amazing. You should definitely try the recipe if you get a chance.